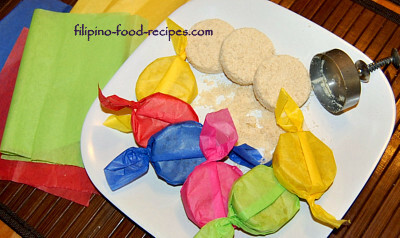 Polvoron or Filipino polvoron is made by toasting all-purpose flour, then adding powdered milk and sugar. Unsalted butter or margarine is then added as binder. An oval, round or flower-shaped aluminum tin mold is used to form this sweet concoction, and it's wrapped in either Japanese paper or colored cellophane. It is a variant of the Spanish shortbread of the same name, an almond cookie popular during Christmas season. The ingredients are more or less the same for both, except that the Spanish kind are cooked further by baking after they have been formed. Both have toasted flour, sugar and butter and both are formed using a cutter or mold to shape them, but the Filipino polvoron is wrapped and ready to serve after being molded. Pulburon is often used in whistling contests during town fiestas. The contestants were made to eat a pulburon, then made to whistle - which is quite hard to do. Give it a try it, you'd be amused yourself! 1 Toast the all-purpose flour on the stove top, stirring continuously, for about 8 - 10 minutes or until it is medium brown in color. 2 In a big bowl, mix the sugar and powdered milk, and add the toasted flour. 3 Add the softened butter and mix thoroughly. 4 Wrap using a cut Japanese paper or colored cellophane. 5 Serve and enjoy the sweet confection. 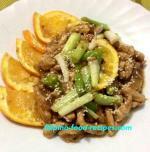 I specially like the taste of Dari Creme Classic for this recipe. Try using it if it's available in your area. The butter or margarine is softened and not melted because it binds better if it's not in liquid form. If you want to use the oven to toast the flour, preheat the oven to 350 °F; Put the flour on a cookie sheet and place in the oven for 8-10 minutes, mixing every 2 - 3 minutes. Where to buy the Japanese paper here in the US? Try places that sell Gift Tissues or Gift Wrapping Tissues, they come in different colors and the texture closely resemble, if not better than the Japanese paper.